Beneficiaries affected by dementia and other debilitating conditions benefit from being part of the community. We aim to lift the mood of loved ones/carers and those with dementia and debilitating conditions by enabling them to share quality time together with people that understand rather than respite apart. 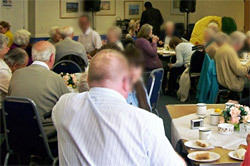 We provide a choice of community based activities, where guests can begin to relax with lunch and musical entertainment, free raffle, multi-choice quiz and mid-session tea/coffee and cake break. Guests don’t have to live in the Blyth, Morpeth or Wansbeck areas provided they can arrange their own transport and be responsible for their loved one during the event. The Tuesday and Thursday community-based days start at 11am and finish at 2pm. Guests will attend an agreed monthly day and arrive in time for lunch at noon. Raffle prize donations and a small contribution to our costs are appreciated. Ring or e-mail using the details on our Contact us page.